The player, announcer, reporter, and author Jesse May is reporting from the World Series of Poker. His posts can be found over on a relatively new website, called The Poker Farm. Great news for those who enjoy well-written, insightful reporting and storytelling about the goings-on at the WSOP. American by birth (he grew up in New Jersey), May became a big part of the U.K. poker scene starting over a decade ago thanks initially to his involvement as both a player and commentator during the first season of the ground-breaking “Late Night Poker” show (in 1999). He’s been commentating on various shows ever since, earning him the nickname “The Voice of Poker” across the pond. I’m seeing four posts thus far from May over at The Poker Farm. 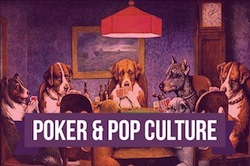 The first, dated June 1, is titled “Poker is going back to the Wolves,” and immediately addresses how the events of “Black Friday” fundamentally altered poker’s long-established world order, in a sense sending poker back to the pre-Moneymaker days when the dichotomy between sponsored or “patched” players and everyone else didn’t exist -- when poker’s “class” system (as we might call it) was based more directly on success at the tables than by other commercially-driven factors. May expresses excitement about the prospects afforded by this new arrangement -- “I’m clapping my hands with glee,” he writes -- a revived poker world suddenly shot through with adrenaline and emotion, with nearly everyone now playing without the safety net of sponsorship. That theme of poker “going back to the wolves” is furthered in May’s subsequent posts. “You Sanctimonius Little” addresses Full Tilt Poker’s petulant response to the Phil Ivey announcement and lawsuit. “Brits in Flow” reflects on the British players’ early successes at the WSOP. And “Brandon Adams Blog” finds May replying to a post by Adams on the “Macroeconomic Woes” site in which the Full Tilt pro addresses some of May’s observations. The latter exchange between May (left) and Adams (right) particularly caught my attention yesterday. 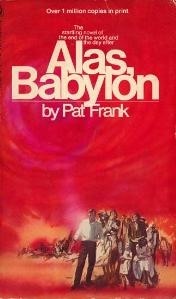 Not long ago I made reference to Adams’ own poker novel, Broke (2008), which I’ve recently picked up. I’ve heard Adams praise May’s novel in the past, and he does so again at the start of his post from yesterday, titled “The Center Cannot Hold,” when he notes how he considers Broke as “an afterword” to May’s story. As Adams’ own shaky confidence in Full Tilt Poker suggests, if what he is saying is true, poker’s prospects are especially dim. Indeed, my first thought when reading that statement was to think FTP hasn’t shown much evidence it can “hold it together,” and thus I’d hate to believe the rest of us are depending on that happening. 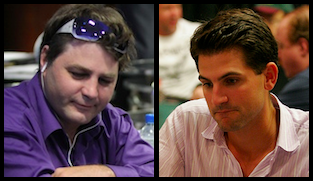 A most interesting bit of back-and-forth here by a couple of poker’s bright thinkers. I can’t help but think Adams is a bit too swayed by that loyalty he professes to his sponsoring site. I do find provocative Adams’ point that online poker “successfully sold” an idea about poker to the culture at large, causing “many people [to] look at poker as almost like a normal industry.” But really, after Black Friday -- and most particularly after Full Tilt Poker’s abject failure on all fronts since April 15th -- I certainly don’t see FTP ever successfully selling such an idea about poker’s legitimacy again. And I don’t really believe the stubborn wearing of an FTP patch is going to change that very much. Is poker “going back to the wolves”? Or has it always been that self-interested, uncivilized, immoral, savage world it was when the game first made its way across the continent a couple of centuries ago -- despite the often-successful recent efforts of some to convince us otherwise?